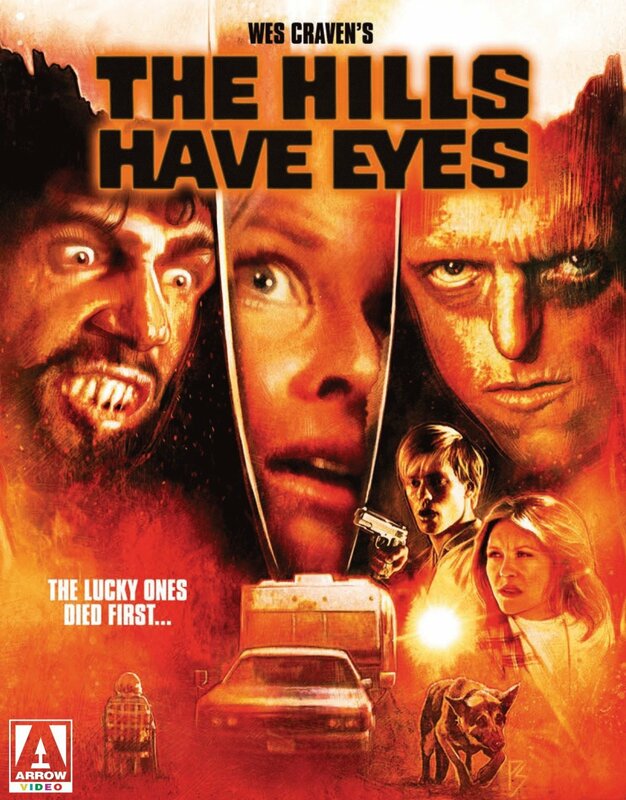 Rupert Pupkin Speaks: Arrow Video - SLUGS and THE HILLS HAVE EYES on Blu-ray ""
I'm certainly an appreciator of movies that take their time. Setting up characters and their backgrounds is quite important to helping us connect to them and really feeling for them when things go south. As horror guru Elric Kane recently tweeted, "If I don't care, it don't scare". While I do agree with this on hundred percent, there is something to be said for shaggy little movies that just dive right in and start knocking people off. 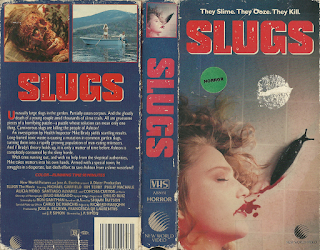 SLUGS has its first character death about the one minute mark so you can hardly accuse it of laying a lot of groundwork. 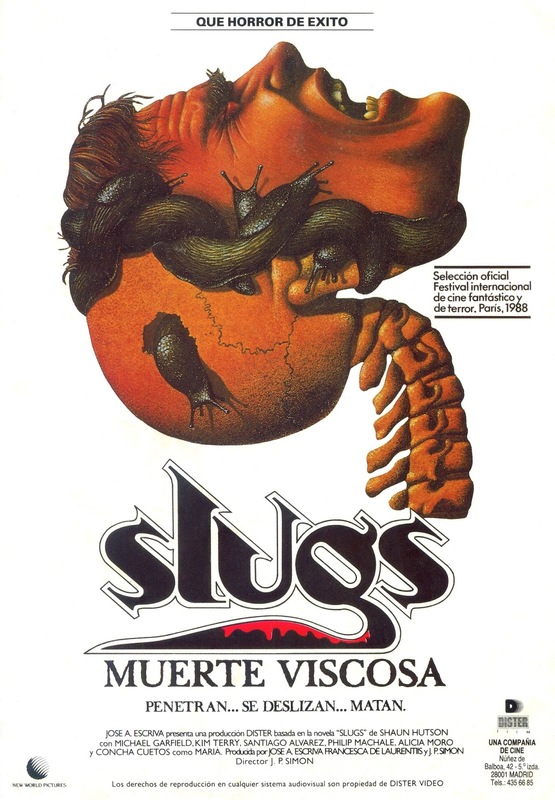 It's no surprise that Juan Piquer Simon (the director of PIECES) could bring something like SLUGS to the screen. He's one of those directors that seems to be from another planet or something. If you watch his magnum opus PIECES, you will see humans behave in ways that make them seem like extra terrestrials. This isn't a bad thing necessarily as it makes for a highly entertaining viewing and the same can be said for SLUGS. Personally, I am not a fan of slimy things. My daughter is pleasantly occupied by this and is therefore always trying to get me to touch gooey things whenever she encounters them. So needless to say, I'm a pretty easy mark for a killer slug movie. I'm even more repelled by cockroaches in movies, but gastropods do just fine in making me cringe. And the prospect of falling naked onto an entire floor covered with them (as depicted here) quite literally makes me jump out of my seat. Just as a funny aside - hats off to this movie for having a character actually read his own eviction notice (last warning) aloud as opposed showing a quick shot of it to let us know he is down on his luck. Juan Piquer Simon also demonstrates an unusual ear for scoring movies with some of his music choices here. Part of it is just the movie having come out in 1988, but there are other things about it that are downright odd. A triumphant horn cue (like an old TV theme song) plays for the short ten or so seconds it takes our heroes to drive up somebody's driveway. The whole thing reminds me a bit of Jeff Lieberman's SQUIRM from more than a decade prior. Just the idea of carnivorous worms or worm-like creatures taking down so many people is silly as hell, but both movies manage to make the idea passable if not realistic in any way. 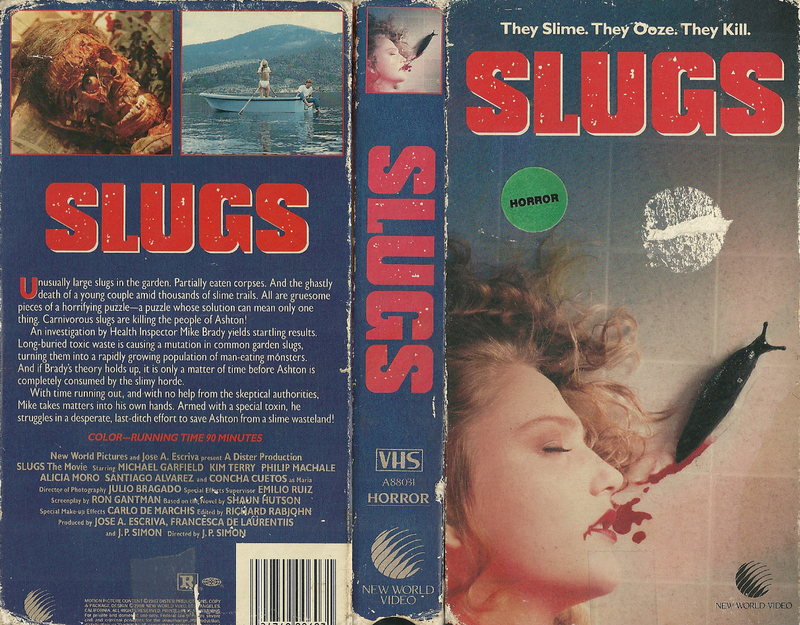 Props to SLUGS for some interesting and memorable gooey special effects including a kind of amazing head-melting death scene in a restaurant. Wes Craven is such an interesting filmmaker in that his career stretched for so long that he has several distinct phases. For instance, in the 1970s you got what I like to think of as his "down and dirty" work - including things like THE LAST HOUSE ON THE LEFT and THE HILLS HAVE EYES. It's a bittersweet thing for me to continue to revisit the films of the great Wes Craven when I know there will never be another one. I'm not sure if that colors my take on them or not, but it is hard to remain unaffected by that fact. Though I did not hold him in quite as high regard as some, he certainly was a man who had an impact on my love of cinema. I do credit horror movies for pulling me deeper into a love of film and I've talked to many others that have a a similar experience with them as a "gateway drug". NIGHTMARE ON ELM STREET took hold of me in a way I never could have predicted in that it was truly one of the scariest things I'd seen at the time. This had a lot to do with the fact that it was about dreams and thus felt like it could reach beyond the confines of being just a movie and stick inside my head for later night terrors. It did do that a bit if I recall. That was an experience, like so many I had in the VHS days, that left me hungry for more. Horror was "forbidden fruit" when I was in late middle school and early high school. Not that my parents were incredibly hardline about it, but they themselves didn't care for horror so it was not something we would look for as a family at the video store. Horror was relegated to sleepovers and other such late night viewings and that only made it all the more enticing. As Craven moved into the 1980s, his films became more and more fantastic. 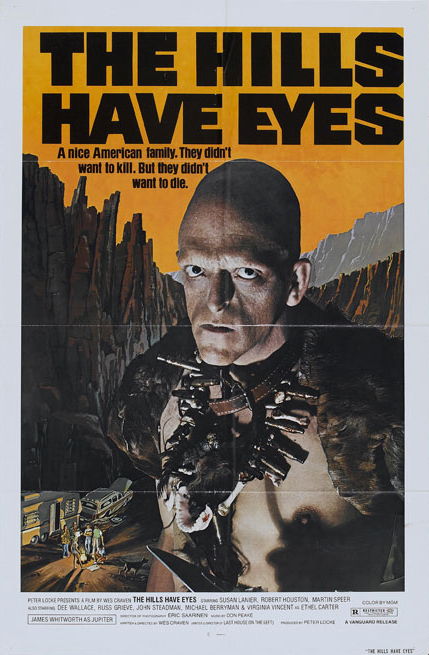 The grittiness of HILLS HAVE EYES was left behind for more elaborate horror. I find it interesting though that Craven has always seemingly been in touch with the idea of waking nightmares. Literally so with Freddy Krueger, but even HILLS and LAST HOUSE are truly terrifying nightmare scenarios that play out before the eyes of their unfortunate victim characters. He really seemed to be into portraying the darkness depths of the human mind and the things that the evilest of evil people were capable of. In addition to that, Craven had this way of sometimes taking everyday experiences, be it bad dreams or getting stuck in the middle of nowhere or whatever and mining them for the most possible horror. Though it may not be a director's goal to have their films basically create phobias in people - it's a pretty powerful thing that they can. It furthermore shows the impact that truly grounded terror can have once set loose in the imagination of a movie viewer. I'm still a bit afraid of open water ever since seeing JAWS one too many times as a kid. THE HILLS It is even more frightening to imagine being completely cut off from contact with others in this day and age of ever present connectedness to others via technology. The idea of "you are in my world now" (as portrayed in both HILLS and THE TEXAS CHAINSAW MASSACRE) can be as haunting and dreadful as anything as it represents a lack of control that we so desperately cling to today with our phones and other devices. We curate our lives and our experiences through images and messages that we specifically select and the idea of having our dominions not only taken out of our hands, but skewed into some psychotic family's twisted universe is the epitome of panic and dread. When the characters in HILLS start to realize that they are now inside a domain that is lead by the awful whimsy of human animals who are capable of things beyond the farthest reaches of their own creative torturous thought - it is a sobering revelation. Despite some outlandish conceits, HILLS is a movie for me that exemplifies true terror in many ways and it still resonates today. Also, I am forever amused by the fact that this movie came out the same year as STAR WARS and only a few months after. Two more diametrically opposed visions have rarely been placed in such close proximity to one another.